Access-Providers.com, ("The Company") agrees to furnish services to the Subscriber, subject to the following TOS (Terms of Service). Use of Access-Providers.com Service constitutes acceptance and agreement to Access-Providers.com's AUP as well as Access-Providers.com's TOS (Terms of Service). All provisions of this contract are subject to the TOS (Terms of Service) of Access-Providers.com, and AUP (Acceptable Use Policy). The AUP may be changed from time to time at the discretion of the Company. Subscriber understands that change to the AUP by the Company shall not be grounds for early contract termination or non-payment. Disclosure to Law Enforcement: The AUP specifically prohibits the use of our service for illegal activities. Therefore, Subscriber agrees that the Company may disclose any and all subscriber information including assigned IP numbers, account history, account use, etc. to any law enforcement agent who makes a written request without further consent or notification to the Subscriber. In addition Access-Providers.com shall have the right to terminate all service set forth in this Agreement. Payment: Establishment of this service is dependent upon receipt by the Company of payment of stated charges. Subsequent payments are due on the first of the month for that month's service. The above applies to all accounts and services provided by Access-Providers.com. Payments and Fees: Credit cards that are declined for any reason are subject to a $1.00 declination fee. Service will be interrupted on accounts that reach 10 days past due. Service interrupted for nonpayment is subject to a $200 reconnect charge. Accounts not paid by due date are subject to a $7.95 late fee. Accounts that are not collectable by Access-Providers.com may be turned over to an outside collection agency for collection. If your account is turned over for collection, you agree to pay the company a "Processing and Collection" Fee of not less than $50 nor more than $150. If you desire to cancel your account, please follow the proper procedure to do this as outlined in this TOS. Money Back Guarantee: Each plan includes a full 30-days money back guarantee.Â If you are not completely satisfied with our services within the refund time period specified for your plan, you will be given a full refund of the contract amount excluding overages. No refund is available after that period. This policy does not apply to any additional services such as overages, disk space, bandwidth, maintenance fees, etc.Â Accounts cancelled/terminated by Access-Providers for violating our Acceptable Usage Policy do not qualify for the 30-day money back guarantee. Only first-time accounts are elegible for a refund. For example, if you've had an account with us before, cancelled and signed up again, you will not be eligible for a refund. This is to protect our refund guarantee from being abused. To receive a full refund, contact our customer service department. Account Cancellation: All requests for canceling accounts must be made in writing with at least 30 days notice but not more than 60 days prior written notice and sent to Access-Providers.com Attn: Cancellations, P. O. Box 177, Cortaro, AZ 85652 or you may call 520 744-4457 or fax the cancellation request to 520 744-3066. You must have all account information to cancel.Â If Client has a balance due at the time of cancellation, this balance must be paid in full. Cancellation does not absolve Client of any outstanding financial obligations. New Domain Accounts: All new webhosting accounts involving new domains will be set up and entered into our DNS servers within 3 to 5 business days. Due to unforeseen complications, however, this process may sometimes require up to 7 business days. If the new domain is registered by the account holder, there will be no handling fee. If the domain is registered by Access-Providers.com, on behalf of the account holder a handling fee will be incurred. Transfer of Domains: New webhosting accounts which involve the transfer of a domain from another provider to Access-Providers.com, will require a minimum of seven (7) days to be set up and entered into our DNS servers. In some cases, such transfers may take up to sixty (60) days. Due to the unpredictable nature of the transfer process, no guarantees are made regarding the amount of time a specific transfer may take. If the transfer of the domain is done by Access-Providers.com, on behalf of the account holder a handling fee will be incurred. If the customer cancels service during the transfer period for any reason, all charges are considered earned. Support Boundaries: Access-Providers.com, provides 24 x 7 technical support to our subscribers (except for few holidays and short company meetings when we close our center.) We limit our technical support to our area of expertise. The following is our guidelines when providing support: Access-Providers.com provides support related to your server or virtual site physical functioning. Access-Providers.com does not offer tech support for application specific issues such as cgi programming, html or any other such issue. Access-Providers.com does not provide technical support for YOUR customers. If you can email, we encourage you to email support@Access-Providers.com for assistance. If you are able to get online and have other questions, the answers may be on our home page at http://www.access-providers.com/support.htm - we encourage you to check there first. Lastly, the Help files in the program you are using may have the answer to your question so please do investigate these resources before calling tech support. SPAM and Unsolicited Commercial Email (UCE): Access-Providers.com takes a zero tolerance approach to the sending of Unsolicited Commercial Email (UCE) or SPAM over our network. Very simply this means that customers of Access-Providers.com may not use or permit others to use our network to transact in UCE. Customers of Access-Providers.com may not host, or permit hosting of, sites or information that is advertised by UCE from other networks. Violations of this policy carry severe penalties, including termination of service. Violation of Access-Providers.com's SPAM policy will result in severe penalties. Upon notification of an alleged violation of our SPAM policy, Access-Providers.com will initiate an immediate investigation (within 48 hours of notification). During the investigation, Access-Providers.com may restrict customer access to the network to prevent further violations. If a customer is found to be in violation of our SPAM policy, Access-Providers.com may, at its sole discretion, restrict, suspend or terminate customer's account. Further, Access-Providers.com reserves the right to pursue civil remedies for any costs associated with the investigation of a substantiated policy violation. Access-Providers.com will notify law enforcement officials if the violation is believed to be a criminal offense. First violations of this policy will result in an "Administrative Fee" of $250 and your account will be reviewed for possible immediate termination. A second violation will result in an "Administrative Fee" of $500 and immediate termination of your account. Users who violate this policy agree that in addition to these "Administrative" penalties, they will pay "Research Fees" not to exceed $175 per hour that Access-Providers.com personnel must spend to investigate the matter. PLEASE, DO NOT SPAM from your account. As our Customers are ultimately responsible for the actions of their clients over the Access-Providers.com network, it is advisable that Customers develop a similar, or stricter, policy for their clients. IP Address Ownership: If Access-Providers.com assigns Customer an Internet Protocol address for Customer's use, the right to use that Internet Protocol address shall belong only to Access-Providers.com, and Customer shall have no right to use that Internet Protocol address except as permitted by Access-Providers.com in its sole discretion in connection with the Services, during the term of this Agreement. Access-Providers.com shall maintain and control ownership of all Internet Protocol numbers and addresses that may be assigned to Customer by Access-Providers.com, and Access-Providers.com reserves the right to change or remove any and all such Internet Protocol numbers and addresses, in its sole and absolute discretion. Our allocation of IP addresses is limited by ARIN's new policies. These new policies state that use of IP addresses for IP based virtual hosts will not be accepted as justification for new IP addresses. What this means to you is that you MUST use name-based hosting where possible. We will periodically review IP address usage, and if we find that clients are using IP addresses where name-based hosting could be used, we will revoke authorization to use those IP addresses that could be used with name-based hosting. Bandwidth and Disk Usage: Customer agrees that bandwidth and disk usage shall not exceed the number of megabytes per month for the Services ordered by Customer on the Order Form (the "Agreed Usage"). Access-Providers.com will monitor Customer's bandwidth and disk usage. Access-Providers.com shall have the right to take corrective action if Customer's bandwidth or disk usage exceeds the Agreed Usage. Such corrective action may include the assessment of additional charges, disconnection or discontinuance of any and all Services, or termination of this Agreement, which actions may be taken is in Access-Providers.com's sole and absolute discretion. If Access-Providers.com takes any corrective action under this section, Customer shall not be entitled to a refund of any fees paid in advance prior to such action. In the event that a customer exceeds the included allocation, Access-Providers.com may, at its sole discretion, collect a deposit, in an amount determined by Access-Providers.com, against customer's credit card on file with Access-Providers.com. a. Access-Providers.com is under no duty to look at each customer's or user's activities to determine if a violation of the AUP has occurred, nor do we assume any responsibility through our AUP to monitor or police Internet-related activities. b. First violation: Any User, which Access-Providers.com determines to have violated any element of this Acceptable Use Policy, shall receive an email, warning them of the violation. The service may be subject at Access-Providers.com's discretion to a temporary suspension pending a User's agreement in writing, to refrain from any further violations. c. Second Violation: Users that Access-Providers.com determines to have committed a second violation of any element of this Acceptable Use Policy shall be subject to immediate suspension or termination of service without further notice. 16. 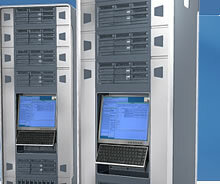 Suspension of Service or Cancellation: Access-Providers.com reserves the right to suspend network access to any customer if in the judgment of the Access-Providers.com network administrators the customer's server is the source or target of the violation of any of the other terms of the AUP or for any other reason which Access-Providers.com chooses. If inappropriate activity is detected, all accounts of the Customer in question will be deactivated until an investigation is complete. Prior notification to the Customer is not assured. In extreme cases, law enforcement will be contacted regarding the activity. The customer will not be credited for the time the customer's machines were suspended. 18. Indemnification: Access-Providers.com wishes to emphasize that in agreeing to the Access-Providers.com Acceptable Use Policy (AUP) and Terms of Service (ToS), customer indemnifies Access-Providers.com for any violation of the Acceptable Use Policy (AUP) and Terms of Service (ToS) that results in loss to Access-Providers.com or the bringing of any claim against Access-Providers.com by any third-party. This means that if Access-Providers.com is sued because of a customer's or a customer of a customer's activity, the customer will pay any damages awarded against Access-Providers.com, plus all costs and attorney's fees. 19. Miscellaneous Provisions: You must provide us with, and keep current, good contact information for you. E-mail, fax, and telephone contacts are used, in that order of preference. c. Access-Providers.com takes no responsibility for any material input by others and not posted to the Access-Providers.com Network by Access-Providers.com. Access-Providers.com is not responsible for the content of any other websites linked to the Access-Providers.com Network; links are provided as Internet navigation tools only. Access-Providers.com disclaims any responsibility for any such inappropriate use and any liability to any person or party for any other person or party's violation of this policy. d. Access-Providers.com is not responsible for any damages your business may suffer. Access-Providers.com does not make implied or written warranties for any of our services. Access-Providers.com denies any warranty or merchantability for a specific purpose. This includes loss of data resulting from delays, non-deliveries, wrong delivery, and any and all service interruptions caused by Access-Providers.com. 20. Responsibility for Content: You, as Access-Providers.com's customer, are solely responsible for the content stored on and served by your Access-Providers.com server.